A few simple tips can save you time, money, hassle, and heartbreak when shipping your old drums. Pack well using more than one line of defense against damage! 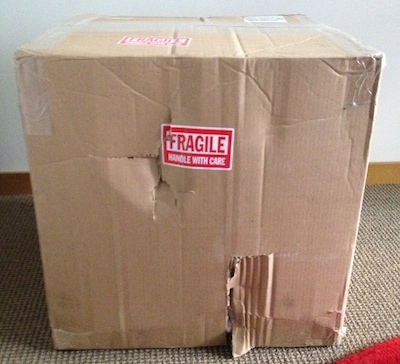 Use a sturdy cardboard box such as the ones used by drum manufacturers to ship new drums. If you want to line the sides of the box with extra cardboard, even better. Place the drum in a plastic bag or line it with plastic wrap, and then go around it a time or two with bubble wrap. Finally, position the bundled drum in the middle of the box filling the extra space with newspaper to keep things snug while in transit. This helps prevent dings, dents, or worse if the carrier mishandles the package. If there are any loose parts or detached components, tighten them or wrap them up separately placing them in an obvious position in the box. You don't want anything rolling around loose in the box which could go missing or cause damage to the drum. Tape the box securely shut and cover all seems in the box with packing tape. Don't use an absurdly oversized box! Many carriers charge you not only for the weight of the package (which can't really be helped) but also for the size of the package. In other words, you're paying for the amount of space the package will take up in their trucks in addition to just the weight. As long as there is enough room to safely insulate the drum, use the smallest box possible. Most snare drums (not including field drum sizes) can be easily packed in an 18" x 18" x 8" box, and in many cases a smaller box is perfectly acceptable. Just use your common sense here! Pack the drum yourself. This will save you money versus what your local shipping outlet will charge you. The shipping stores often charge ludicrous amounts for boxes, packing materials, and labor. Your local hardware store has everything you need including tape, bubble wrap, and cardboard boxes for much cheaper. Do the packing yourself and you'll come out ahead on the overall cost. Also, reusing boxes and packing materials is thrifty and more environmentally responsible! Print the shipping labels online. If you have a way to measure and weigh the package, printing the shipping label at home can save you a few pennies. It's not a major savings but every little bit helps. The biggest benefits to printing your own shipping labels are that you can skip the line and drop the package at your shipping location, or you can have them come pick up the package which is a real time saver. Get a tracking number and provide it to the person on the other end of the deal. This lets the buyer know that the drum is on the way and when to expect the delivery. Tracking packages internationally is less reliable but keeping tabs on shipments in the United States is fairly reliable with any of the major shipping providers.